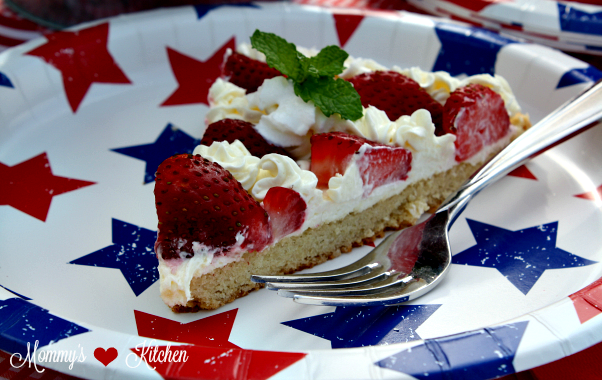 A fun and festive sugar cookie dessert pizza to celebrate the upcoming 4th of July Holiday! Independence Day is quickly approaching, are you looking for a simple festive dessert to celebrate the Red, White and Blue? 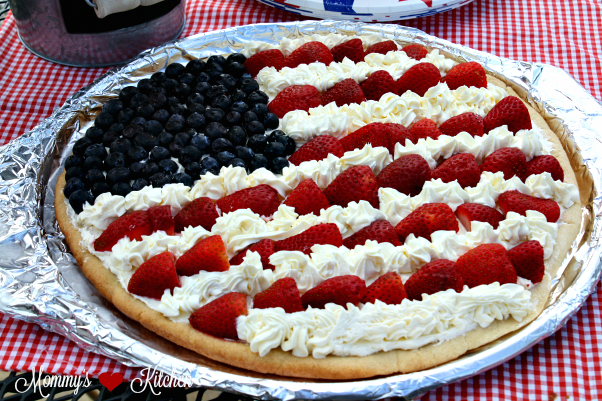 How about making this Patriotic Fruit Pizza! No cookout is complete without a festive dessert, so today I'm sharing the recipe for one of my favorite red white and blue treats. 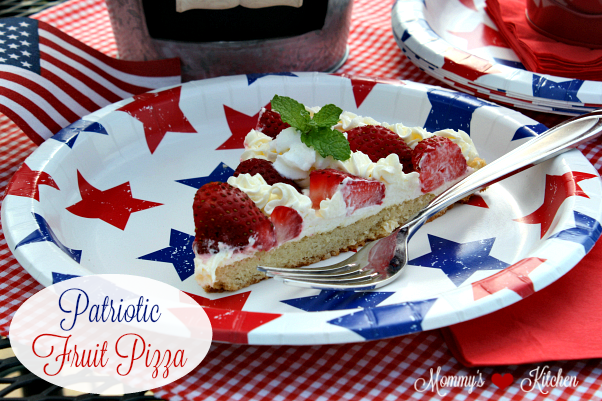 This patriotic fruit pizza is super simple to make and the perfect summer treat. Fruit pizzas have always been a favorite of mine because you can use a variety of in season summer fruits and berries. I picked up everything I needed to make this simple dessert at my local Walmart. Berries are in full swing right now, so pick your favorites. I chose to go with blueberries and strawberries, but blackberries and raspberries are also a delicious choice. 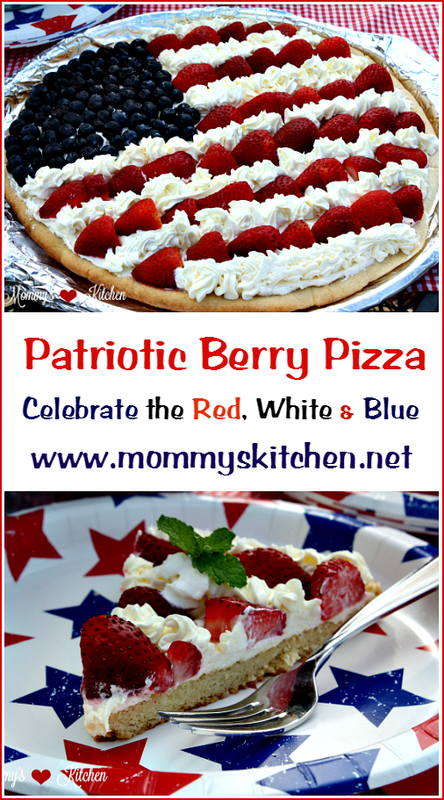 If you need a last minute 4th of July themed dessert, I hope you will try this patriotic fruit pizza because I know you'll love it! While you're at the store stop by Walmarts holiday and seasonal isle, and pick up some festive tableware and patriotic decorations to complete your red white and blue theme. 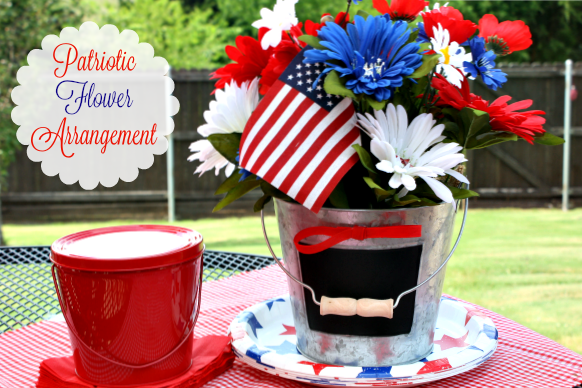 I was able to pull together this last minute patriotic flower centerpiece for under $10! I'm so happy with how it turned out and I think it adds the perfect patriotic touch to any outdoor table arrangement. 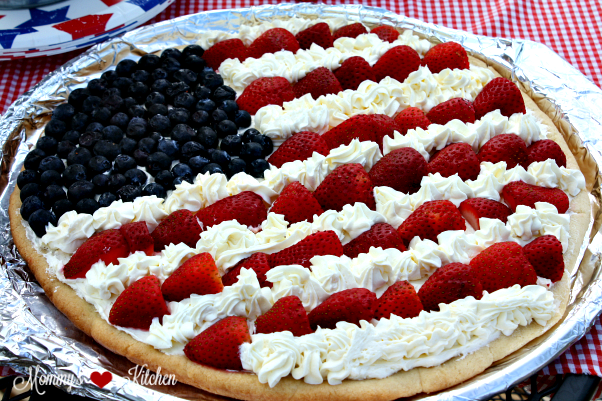 OK lets get started on making the patriotic fruit pizza. First gather all your ingredients, prepare the cookie dough, and rinse and dry the strawberries and blueberries. Preheat oven to 350 degrees. Cut the cookie dough into 1/4 inch slices and arrange on a 14 - 15 inch pizza pan that has been lined with parchment paper or foil (sprayed with non stick spray) for easy cookie removal. Press the cookie dough pieces together to form a pizza crust. Bake in a 350 degree oven for 15-18 minutes or until the cookie dough is lightly golden brown on top and around the edges. Let the cookie crust cool completely. Prepare the cream cheese filling. Spread 2 cups of the cream cheese mixture over cooled crust to within 1/2 inch from the cookie edge. Set the remaining cream cheese mixture aside. In the upper left side of the crust, add the blueberries. Arrange the strawberries in 5-6 rows across the cookie pizza. Using a pastry bag with a star tip or using zip lock bag with the end cut off, add the remaining cream cheese mixture and pipe between the rows of strawberries to form strips. Serve immediately or store in the refrigerator. To serve cut into slices using a pizza cutter. To make the sugar cookie crust, in a medium size bowl beat shortening and butter together with an electric mixer. Add sugar, vanilla extract and beaten egg. Mix to combine. In a separate bowl, mix the flour and baking powder together, add to the creamed mixture. Mix together scraping the sides of the bowl. I used my kitchen aid mixer (with the paddle attachment) and mixed it until the dough pulled away from the bowl. Form the dough into a log and wrap in plastic wrap. Refrigerate for at least 1 hour. Preheat oven to 350 degrees. Cut cookie dough into 1/4 inch slices and arrange on 14 - 15 inch pizza pan that has been lined with parchment paper or foil (sprayed with non stick spray) for easy cookie removal. Press the cookie dough pieces together to form a pizza crust. Bake in a 350 degree oven for 15-18 minutes or until the cookie dough is cooked and lightly golden brown. Cool completely. In a large bowl, beat cream cheese, sugar and vanilla extract together until smooth. Fold in the whipped topping. Spread 2 cups of the cream cheese mixture over cooled crust to within 1/2 inch from the cookie edge. Set the remaining cream cheese mixture aside. In the upper left side of the crust, place the blueberries and arrange the strawberries in 5-6 rows across the cookie pizza. Using a pastry bag with a star tip or using zip lock bag with the end cut off, add the remaining cream cheese mixture and pipe it between the rows of strawberries to form strips. Serve immediately or cover and refrigerate until ready to serve. Store any leftovers in refrigerator. I sure do love your posts and recipes. Especially these patriotic ones. Everything about this is SO pretty! Thanks for sharing. I am wondering if you could just use pre made cookie dough that comes in the tube? you can absolutely use store bought refrigerated cookie dough. I've done that numerous times when need a quick dessert.